Bakshaish is a town on the banks of the Talke Rud River in Northwest Persia. 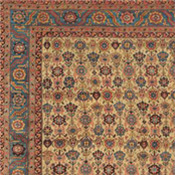 Situated in the mountainous region 60 miles east of the large city of Tabriz, Bakshaish is the oldest rug weaving village in the region of Persian Azerbaijan, noted for carpets with highly artistic, tremendously diverse abstracted adaptations of age-old tribal and classical Persian motifs. 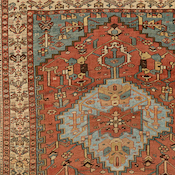 The finest antique Bakshaish (also spelled Bakhshayesh or Bakshish) are typically larger carpets (8×11 to 13×17) with a geometric, folkloric character found predominantly in small tribal rugs. 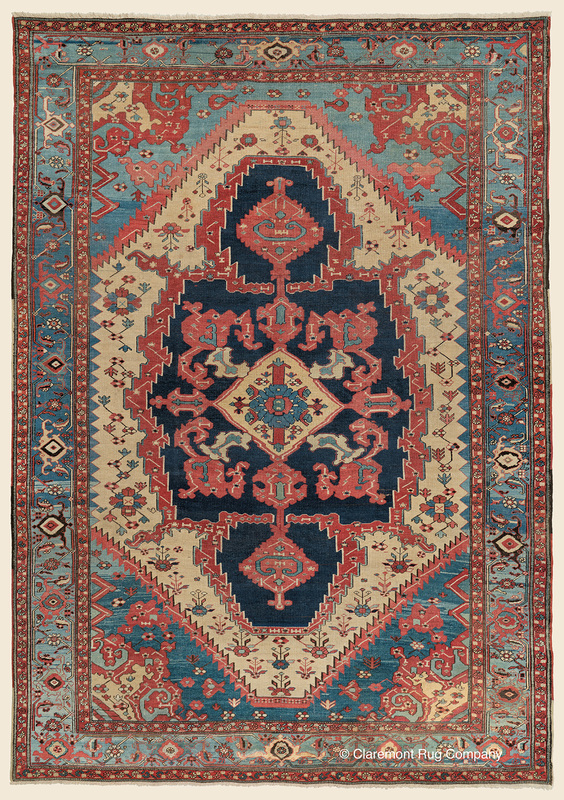 In their softness of color and line, the appearance of antique Bakshaish carpets somewhat resembles the Sultanabad carpets of Central Persia, yet with designs drawn to substantially more free form, improvisational and geometric proportions. These are folk art compositions in which the individual artistic creative decision of the weavers can usually be abundantly seen. 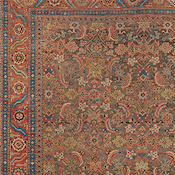 The viewer will take delight in discovering the idiosyncratic temperament of the Bakshaish weaver, as seldom is one motif drawn in exactly the same fashion twice, and borders, even center medallions, are usually playfully misshapen. The best antique Bakshaish carpets are connoisseur’s delights, exhibiting truly original patterns; unusual movement and asymmetry of design; and a richness and maturity of color obtained by the masterful use of natural dyes. They transcend the decorative to become truly one-in-the-world art objects. 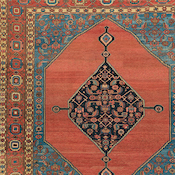 Bakshaish weavers employed both soft reds and navy tones for the base color of the field, with the use of ivory, or sometimes golden Camelhair grounds being particularly rare and beloved. Undyed camelhair creates a particularly luminous backdrop of the field. 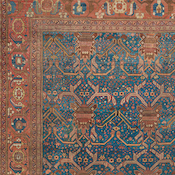 Exceptional blues are a hallmark of these antique Bakshaish rugs with hues of azure, turquoise, peacock and teal. Muted salmons, corals, buffs and yellows, as well as rich spring to jade greens, can also be found in abundance. Antique Bakshaish carpets have a structure similar to carpets of the nearby Heriz group, although their weave is usually somewhat finer. Bakshaish carpets were the product of the Persian home craft, usually woven in room size or oversize formats on a loom attached to the outside wall of the weaver’s home.  Area size Bakshaish rugs (normally 4ft 6in x 6ft 6in and sometimes as small as 2ft x 4ft) are only occasionally seen, the best of which are highly prized by serious collectors. 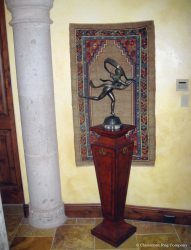 Extremely seldom seen in this style are sizes larger than 12×18, runners, or keleges (corridor rugs). 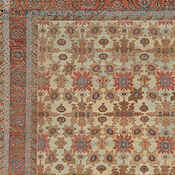 The best Bakshaish carpets offer a unique combination of geometric allover design or graphic geometric medallion format, along with their own intriguing adaptation of the traditional repetitive Herati pattern with unparalleled use of natural color and soft tones for large format carpets. All-over field designs of overscale emblematic or stylized floral patterns offer striking graphic artistry. 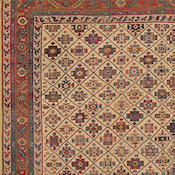 Bakshaish rug weavers are renowned for creating carpets featuring the age-old Tree of Life motif. They fit perfectly into contemporary or casual decors, and brilliantly enhance the casual, organic ambiance of mountainside homes. Among connoisseurs, early antique Bakshaish rugs, (especially circa 1875 or earlier, as well as the best late 19th-century examples) are the most highly prized of the extremely desirable Northwest Persian village carpets. For lovers of tribal rugs that are only found in smaller sizes, the Bakshaish style offers a similar geometric, folkloric character in carpets of larger sizes. 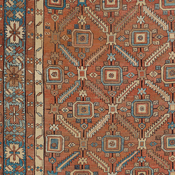 The 19th-century examples of Bakshaish weaving, if artistically distinguished, memorable in their beauty, and in good condition, have performed very solidly as art investments. Because of their great rarity, greatly inspired artistry, and overwhelming appeal, the best 19th-century representatives are widely sought after. Collectible-level pieces seldom come available on the market, and when they do, regularly receive strong demand.